Methadone is now primarily used for the treatment of narcotic addiction. The effects of methadone are longer-lasting than those of morphine-based drugs. Methadone’s effects can last up to 24 hours, thereby permitting administration only once a day in heroin detoxification and maintenance programs. As explained here, the goal of this and similar programs is to help people rid themselves of addiction and pain. We might all agree that these are lofty and perhaps even attainable goals. But I have grave doubts that plopping this dispensary down in a predominately residential neighborhood will improve the quality of life for those living nearby. This dispensary was formerly located at 18th and York but forced to move due to impending development of that block into 300 apartments. – The clients must consume the drug on site, and then leave. – The dispensary will serve 200 clients a day. – The clients will enter thru the new door being installed on the north wall of the back part of the building. – There seems to woefully inadequate parking. – Gaylord on-street parking is usually full. – No posting is necessary because in legal terms the property is zoned for office use, and a dispensary equals an office (legal precedent). – General construction permit was pulled 9/24/2014, but does not appear to be posted. – No neighborhood involvement needed or sought. – The owner is Victor Kolouch of Kolouch Properties, LLC, who has been the owner of the ARTS administrative building next door at 1648 Gaylord since 2005. To be fair, one observer told me that the patients are well-behaved because they are paying for their drugs and don’t want to screw up and lose their daily fix. She has watched them come and go at 18th and Gaylord for 5 years. The tentative meeting set for 7:00 pm on Thursday, Oct. 2 has not yet been verified. As soon as I hear I’ll post it here. I’m going even if I don’t hear back. See you there. Update: The meeting time and place have been confirmed. I'd love to hear more about a neighborhood meeting. I'm at 16th, just off Gaylord. Go to the meeting, Alison. You will hear a lot of lies about methadone. And methadone addicts often sell the methadone to buy heroin. Meet your neighbor, hear their soothing words, none of which will be true. Since September, three More drug facilities have opened in the uptown neighborhood. We are stuffed to the gills with this, and unless we all do something, they will keep coming. Like Alison, I look forward to the community meeting on Thurs. 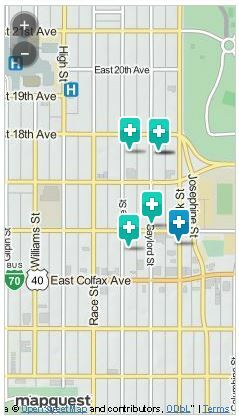 an additional clinic is being opened at the corner of Colfax and Fillmore. currently it is being rennovated. this is even closer to the school than the clinic at Gaylord. again no posting or community involvement. meeting at denver botanic gardens on wednesday 24th in evening.